Quite often with two part stories, the second part is by far the weakest, almost as if the writers had put everything into a spectacular cliff-hanger, and then don’t know what to do with part two. With Human Nature being such a great first part, coming to part two there was a definite question mark over whether The Family of Blood would live up to it. I’m glad to say therefore that part two more than lived up to it, indeed in ways it possibly even surpassed it giving a fantastic conclusion. Ultimately, the episode turned into a character piece. The cliff-hanger was resolved not by a flash of the Doctor through the Doctor John Smith persona, but purely by Martha. Indeed at one point Nurse Redfern has to encourage a shocked and confused Doctor John Smith to even escape. In the course of the escape Martha even comments how hopeless he is as a human. They return to the school where Doctor John Smith mobilises the boys, all of whom have been training to protect King and Country, and they mount a defence of the castle. However faced with the Family of Blood and the scarecrows they have little chance, and with the headmaster and another teacher vaporised the boys run. John Smith, Martha and Nurse Redfern end up hiding in an abandoned cottage, whilst the Family of Blood start bombarding the village. Reunited with the pocket watch that holds the essence of the Doctor, we have the heart of the episode, where Doctor John Smith has to choose between a normal life as a human, or to sacrifice himself to become the Doctor again and save humanity. Essentially, the episode boils down to very much a character piece. When ultimately Doctor John Smith chooses to open the watch, and to return to being the Doctor, the actual defeat of the Family of Blood is very brief. You see almost snapshots of how the Doctor despatches each member of the family – giving them the eternal life they crave, but trapped for eternity in various ways. Then the final few minutes finish off the story of Tim, the boy who has been hiding the pocket watch, and also continue the First World War theme. The Doctor gives him the watch for good luck, and thanks to his vision of the future seen in episode one he survives the war. The episode finishes with Tim, now an old man, sitting in a wheelchair at a Remembrance Day service, holding the pocket watch. As the priest says the familiar words of the service, the camera pans from a tearful Tim holding the watch across to the figures of the Doctor and Martha on the other side of the green. the Doctor is never brought back. In both cases – Tim, and Doctor John Smith they realise that it is something that has to be done. As Nurse Redfern says to the Doctor when she refuses to come with him, Doctor John Smith was by far the braver man choosing to sacrifice himself, whereas all the Doctor did was hide, and in doing so caused the unnecessary deaths of the villagers who the Family of Blood had killed. The two episodes had complex themes, themes that I’m sure will take time to explore. However they also turned in some fantastic performances. 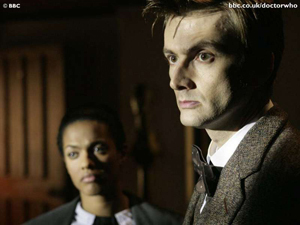 Freema Agyeman again had a chance to shine as Martha, with David Tennant giving a great performance in the dual roles of Doctor John Smith and the Doctor. This was especially highlighted in moments when he first held the pocket watch where the two characters switched back and forth with a moment when he was clearly the Doctor, and then returning to an increasingly scared Doctor John Smith, having to choose what to do. Perhaps the episode was so good because of it’s genesis as a book, although a number of elements of the book were changed for the TV story, however you can now see for yourself, as the BBC have replaced the eBook of the original novel so if you want to compare the two you can. To help you along, you’ve also got extensive authors notes about the original book, plus Paul Cornell’s own notes about adapting it for the screen.